Dozens of things can contribute to icky, chapped lips such as exposure to cold air, breathing with an open mouth, licking your lips, dehydration and using irritating cosmetics. 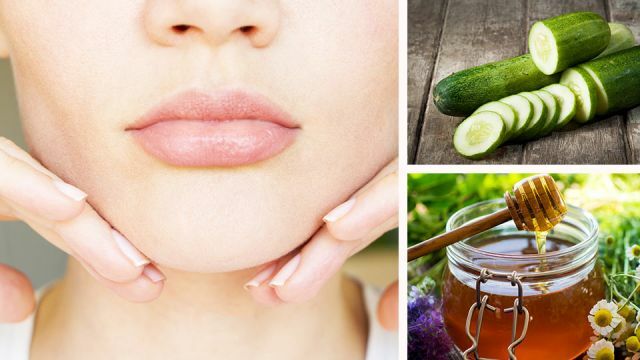 Use these five home remedies to get baby soft lips no matter what season it is. Before we dive into natural remedies, please consider ditching your commercial lip products. The desire to have luscious lips drives the beauty world. Unfortunately, there are thousands of lip products that contain harmful ingredients such as phthalates, talc, parabens and even formaldehyde! Dry and chilly air in your home can result in cracked lips. To keep the air in your home moisturized, try using a humidifier to increase the level of moisture in the air around you. Running a humidifier in your room overnight is helpful for maintaining atmospheric moisture while you sleep. Humidity, in general, is beneficial for your health. Environments with less humidity can contribute to issues related to your teeth, skin and even your risk of developing the flu. When your skin is feeling itchy and dry, humidifiers can help replenish moisture and soothe troublesome skin conditions like eczema or psoriasis. Be wary of using your humidifier at a level more than 50 percent because excessive humidity can cause bacteria and other microorganisms. Exfoliating your lips can remove dead skin and leave them looking supple. The good news is, you don’t have to use expensive store-bought lip scrubs that are often full of toxic ingredients. You can make your very own lip all-natural lip scrubs at home. For the simplest lip scrub, apply honey and brown sugar evenly on your lips in a rubbing motion as a natural exfoliator. To add to the exfoliating benefits, you can add the mixture to a toothbrush before rubbing it on your lips. You can also use this DIY lip scrub made of nourishing beeswax, coconut oil, shea butter, calendula oil and peppermint oils. Be sure not to over exfoliate your lips as this can lead to damage. Don’t use lip scrubs more than twice a week. Drinking water may seem like a pretty simple home remedy but you’d be surprised how many people forget to drink water throughout the day. Trying to juggle work, errands, personal time and family duties can push the importance of the simple act of drinking water to the backburner. In the past, I’ve definitely been guilty of forgetting to drink as much water as I should when my schedule became too hectic. Lucky for everyone who is constantly on-the-go, there are apps that can send personal reminders to your smartphone to remind you to drink water. Check out these eight best water apps to use. Eating sodium-laden foods can also contribute to dehydration so steer clear of spicy and salty foods as much as possible. Take lots of water daily (at least eight glasses) and fluid-rich foods to hydrate and protect the skin from the inside. For beautiful lips, be sure to remember to eat foods with healthy vitamins, especially during the winter. Vitamin B is great for retaining skin moisture. Skim milk, swiss cheese, silken tofu, fortified cereals and eggs are great sources of vitamin B.
Vitamin C is another good one. It is an antioxidant that occurs naturally, and most people are able to produce it on their own. However, eating foods such as citrus fruits, green leafy vegetables, strawberries, papaya and broccoli can all provide benefits for dry lips. Since lips have no protection against the sun, vitamin C can also protect lip skin from oxidative stress from sun rays. It limits the damage induced by ultraviolet (UV) light exposure. Vitamin C plays a vital role in collagen synthesis, making it a crucial molecule for keeping lips soft. Higher intakes of dietary vitamin C have been associated with an overall decrease in the risk of dry skin. Green tea isn’t just a refreshing drink full of antioxidants. It’s also used for its anti-aging properties. Studies show polyphenols found in green tea have antimicrobial, anti-inflammatory and antineoplastic effects on skin. Using green tea on chapped lips can reduce inflammation, which can provide relief to aching lips. Check out this homemade green tea lip balm to get rid of chapped lips once and for all. What home remedies have you used to soften your lips? Leave your comments below! Hey Buddy!, I found this information for you: "Green Tea + 4 Other Home Remedies For Painful, Chapped Lips". Here is the website link: https://www.thealternativedaily.com/5-home-remedies-for-painful-chapped-lips/. Thank you.